I collected 21 specimens and these are likely to be Almandine, rather than Pyrope, although all garnets are hybrids. They range in size from 1 carat to .01 with the majority in the latter category. They are presenting in a rough state – not facetted or drilled or worked by man – but as naturally crystallised in cubic system (dodecahedra / icositetrahedra). The gem quality and size is poor, and not gem grade for working en cabochon / shallow cut. 1) The ability to guide its holder through perilous conditions, especially to journey safely through perilous seas. 3) The drawing out / protection from poisons or evil maladies, by sewing into cloth to maintain skin contact. 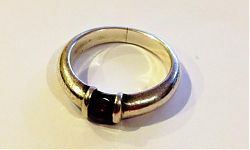 Modern ring with garnet, not a foreshore find! Garnet has a considerable application as an abrasive agent, having a hardness of 7.5 on the Mohs Scale. 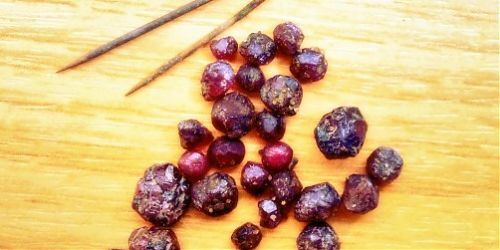 Almandine garnet in antiquity was imported from what is today Austria / Czech Republic and later, along with Pyrope, from the gem gravels of Sri Lanka and India. 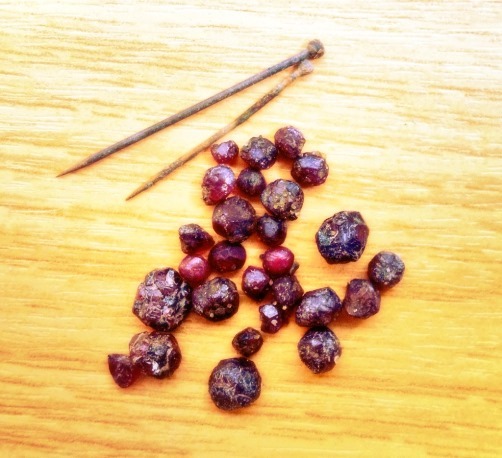 These garnets are likely to have been part of a package, possibly in a cloth bag. Although found in close association with pins, they are unlikely to have formed part of a costume decoration – being too small to have any visual effect, and would appear to be of too poor quality for use as jewellery. On close inspection the pins found in direct association with the garnets, and pins found 10cm away are of two different types.